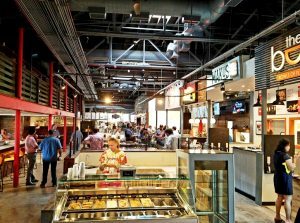 First Take: Delicious Bits at Motorco’s Parts & Labor! 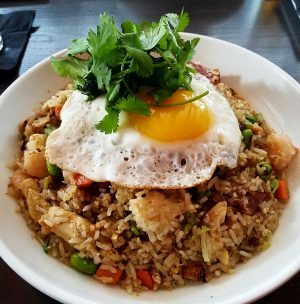 If you haven’t been to Motorco, you’re missing out. Located in a sprawling old garage (hence it’s name), Motorco is a home for live music acts and more. As part of their attached space in the old automobile bays you’ll find Parts & Labor. Super casual and a bit hip, Parts & Labor sports a large bar on one side and an array of seating options in the “dining area”. There’s a large main area and then several other options ranging from patio to side room. Over the bar there’s a large menu sporting the beer list and a tidy food list. I order up a Hoptimist from White Street Brewing to start off the evening and then it’s off to the food! Parts & Labor has a medium sized list of small plates ranging for $3 (fries, salad) to $8 (mussels) so super reasonable prices. 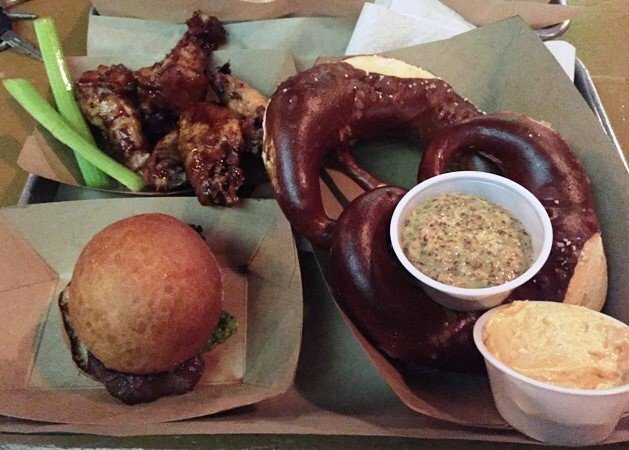 I order up a bunch of plates for the two of us: sliders, fries, wings, pretzel, latkes and baked beans. We get a number on a stand and grab a table to watch Duke trounce Wake Forest. 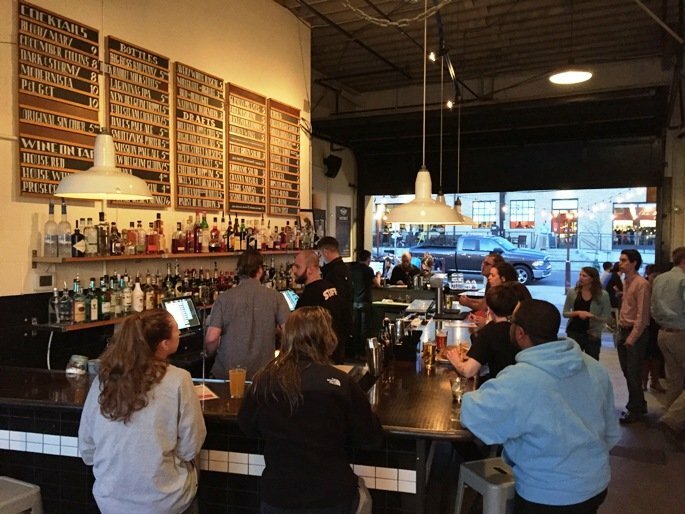 The scene at Parts & Labor is a mix of hipsters and students, younger and cool crowd. The food comes out lickety-split, couldn’t be more than 10 minutes and it’s all served up in paper baskets. We’ve got SO many good-looking plates at our table, it’s hard to figure out where to start! 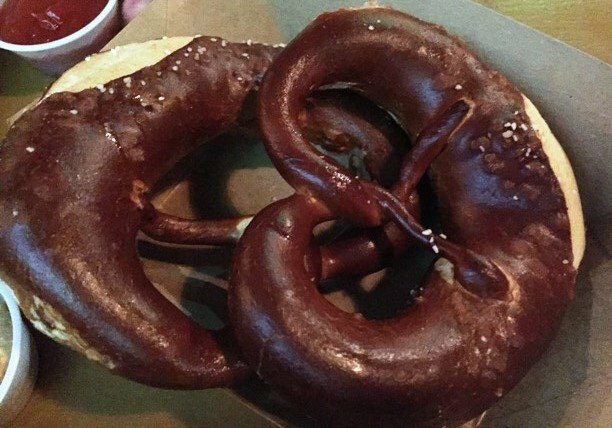 I jump in on the German pretzels which are nicely browned and tender, soft inside. Served up with a thick-grain mustard and cheese spread, you’ve got a winner here. The potato latkes are large, flattened, shredded potato fried up and served with some apple sauce. Decent but serves up luke-warm which throws them off. Moving on with this smorgasboard, it’s time to go to the meats! 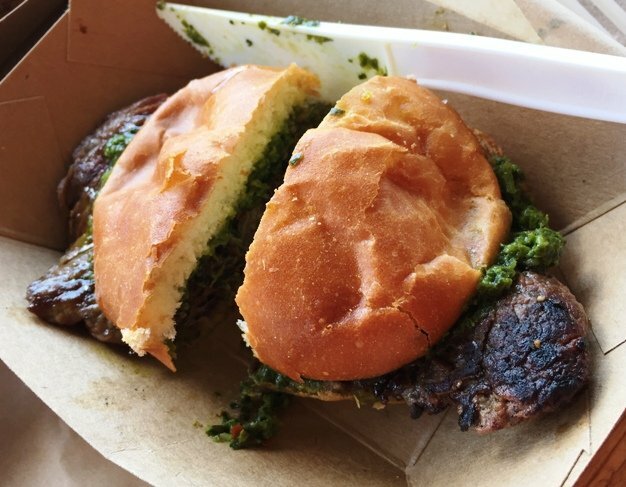 My favorite is the churrasco slider with chimichurri sauce. A tender, seared slice of beef with pungent olive oil and parsley, delish! Really a great concept and served on a nice puffed slider roll. The wings are also solid served with a tangy-sweet sauce they call “motor-oil”. 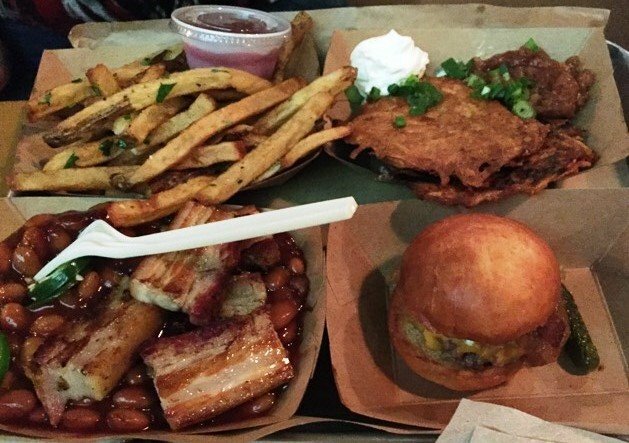 Skin-on fries complement the delicious meats and then I finish off with the baked beans. 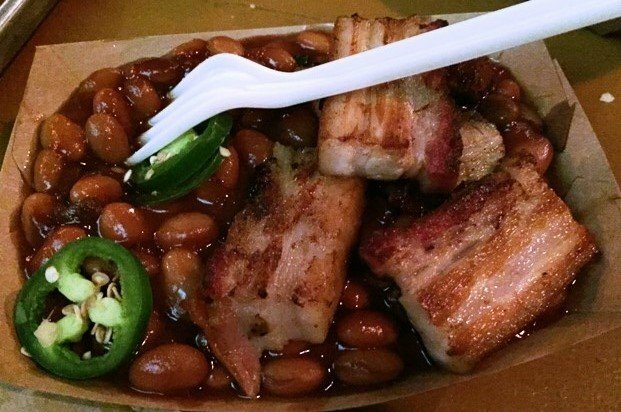 Another excellent dish, home-simmered plump beans with some seared slices of pork belly! None of that white fatty stuff floating in a can, eh? What can I say but I really enjoyed my meal at Motorco’s Parts and Labor. Super-casual, super-delicious works for me. And at very reasonable prices. The beauty of it all down here on Rigsbee is you’ve got lots of decent eating choices all revolving around grazing at the local food trucks or the small plates at Parts and Labor. And having lots of delicious choices is a wonderful option in life!